Just got this letter from NVC . I don't Andesteing why? What does it mean? Last week I got an email saying NVC will schedule an interview and I will get a letter in the mail with date. And now this? Was my mom petition rejected? Or? Were you trying to bring another relative along with your mom on the same petition? Because it’s telling you that you can’t do that. I filed only for my mom but when I was filling out the petition i remember they asked if she has kids ,spouse etc and I put my little brother name as her dependent because he's a minor. That's why I'm confuse. Does it means her petition is been rejected? Or they gonna schedule the interview? 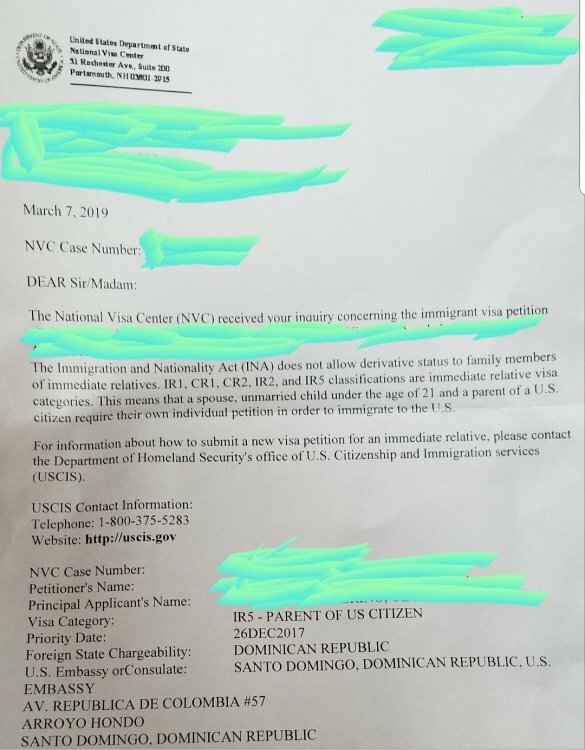 Ir/Cr visa does not allow derivative. Only your mom qualified for visa. Does it meant I have to reapply for her? No. Or at least it shouldn't. How long it will take to get the interview than? I would call and make sure your mom’s case is still active. As others wrote, this letter looks like they’ve rejected your little brother. Don't know what to do... suggestion? Call NVC back. Sometimes you don't get the most helpful CSR. Talk to someone else. If they told you to go on the website it likely means they didn't understand your question. Give them the case number and ask for an update. Ask to speak to a supervisor if necessary. Is any way they can grant him a visa at the same time with her on the interview? No. There are no derivatives for your mother's petition. No. That is what that letter said. The fastest (but not fast) way will be for your mom to petition him once she has a green card. How long will the process take for her? For a child under 21 of a LPR, it is currently taking about 2 years.